So: Buffer Profiles are established, initial Buffer Levels determined … but now things change! The Buffer profile was established. Buffer Levels calculated. Now, as time goes by, things change … new vendors and customers, economy changes, products progress through their lifecycle and gain in demand or slow down, the degree of variability might change. Buffers have to adapt. The characteristics that placed a part into a certain Group for profile purposes might change, and the part needs to be moved into a different Profile group. For example, perhaps a change in vendor made a part a longer-lead-time item with higher variability. Other times, changes in average daily usage might change, for example; the Buffer Level quantity quantity when usage is 25 parts per day over a 30-day lead time is substantially different from the Buffer Level needed for the same part if the ADU increases to 100/day. 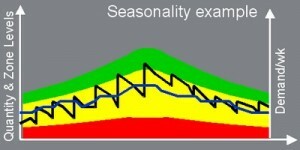 We can view the adaptation as natural adjustments, and planned adjustments. “Natural” adjus tments are justified when the ADU (average daily usage) changes; or when there are “occurrences,” for example if the Buffer is too much in the Green (too much inventory) or too frequently in the Red Zone (a need for more). 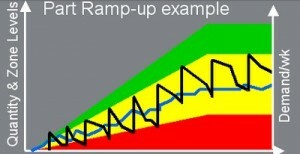 In addition, there’s provision in Demand Driv en MRP for planned adjustments … for example, to have a profile that changes to reflect an expected ramp-up in demand of a new product, or the phasing-out of a product; or to reflect the seasonality of demand. With Dynamic Buffers, for example in the event of a need for an increase in Buffer Level, the system will recommend not only the usual replenishment to “top of green” but also an additional amount to increase the Level of the top of green to reflect that there needs to be more inventory to provide the same level of protection as previously existed with a lower rate of demand. Similarly, when there is too much time in the “over the top of green” zone, there is clearly more inventory than needed to provide the protection and the system will recommend that replenishment be to a reduced top-of-green level. 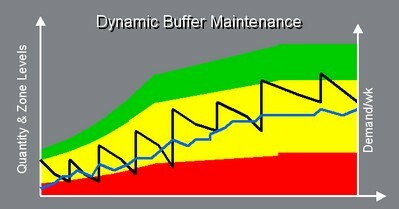 The value of this should be obvious; inventories increase as the Buffers “flex” to accommodate increased demand (ADU) or too much time in the Red Zone or a ramp-up pattern while providing superb availability or customer service levels; but they also decrease when the ADU decreases, or when there’s too mcuh time in the Green Zone or a phase-out, again without threat to service levels. 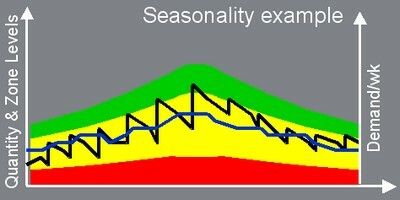 And one aspect of this is, dynamic Safety Stock levels, in that Safety Stock is one of the components of the Red Zone. So in effect, inventories are constantly right-sizing – a manufacturer’s dream in a world of volatility and variability.